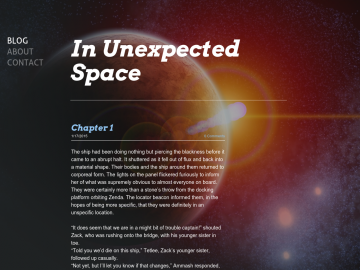 "The ship had been doing nothing but piercing the blackness before it came to an abrupt halt"
In Unexpected Space is a futuristic odyssey fraught with all the troubles of shipping between the stars. It follows the journeys of an underfunded crew who have only begun to understand the vastness of the space surrounding them. In Unexpected Space has not been tagged yet. Help others find In Unexpected Space by tagging it! In Unexpected Space has not been reviewed yet. In Unexpected Space has not been recommended yet.